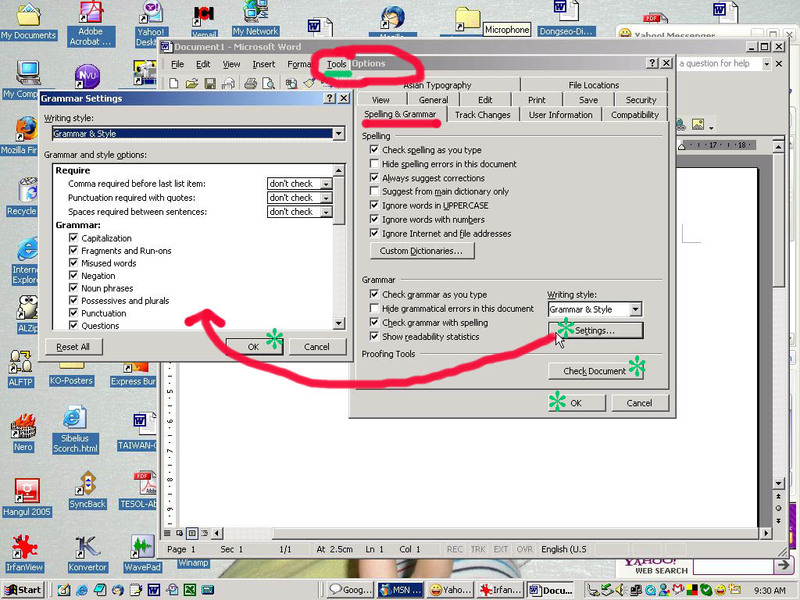 There are many options in word processing, including non-processors such as simple email or the Notepad (메모패드). Among the higher end options in Korea, we have MSWord and Arae Hangul (HWP). Each system has various advantages and disadvantages, and it's not the purpose of this page to argue those. Instead, let's look at one aspect where MSWord has a clear advantage over almost all other commercial wordprocessing systems - the Grammar Check. Many wordprocessors have spell-check functions, some better than others. Some also have grammar-check functions. The Open Office Writer program does not come with a spell-checker (there are add-on applications you can use), and while new versions of HWP apparently have a grammar-checker (I haven't found it!) there seems to be no options in grammar. MSWord allows the user to choose from many grammar options, both local language variations (US versus UK versus Australia, etc) and "style" (simple versus university thesis style, etc). When the grammar checker is on, it works alongside the spell-checker. Spelling errors get a red squiggly line under words, grammar problems get a green squiggly line. And you get suggestions! Below are some screen captures that show how you can change settings. MSWord 2003 follows the Word '97 system. I can show all of the steps in changing your grammar-check settings in one screen capture. From the toolbar, click Tools then Options. Then choose the Spelling & Grammar tab, click the options you want, and click the Settings button for more options. 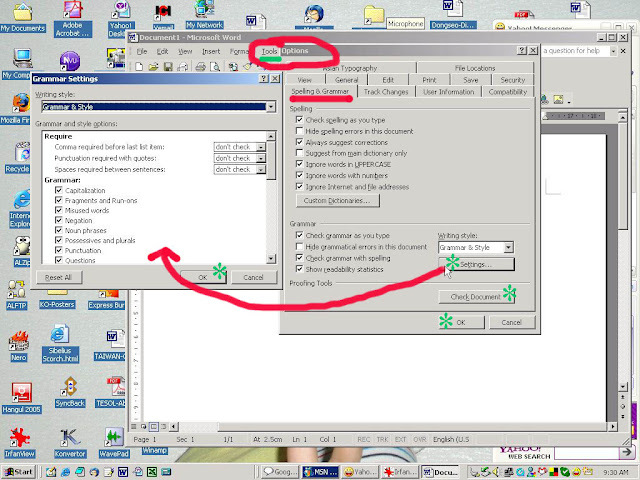 In MSWord 2007 and later the new ribbon system means that we now work from the Microsoft logo at top left, and then the Word Options button at the bottom. This opens a new pop-up window. In this new window, select the Proofing button to access your choices. (These images are from a "fusion" system, so some things appear in English and some in Korean.) Then you can select various options, including the Writing Style from the pull-down menu and/or click the Settings button to make more choices.